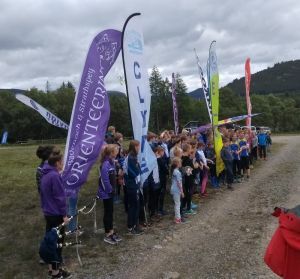 The Jamie Stevenson Trophy is an annual Scottish inter-club junior competition, named after the ESOC honorary member (a former ESOC junior) who won a gold medal at the 2003 World Orienteering Championships in Switzerland. This year the event was hosted by MAROC on the slopes of Morrone, by Braemar. The terrain is heathland, juniper and birch woodland with a network of paths, and no fence-crossings. 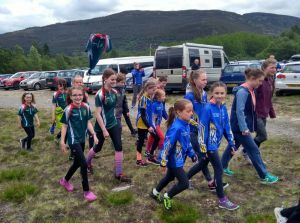 11 Scottish clubs were competing, with around 120 juniors taking part. There are Yellow, Orange, Light Green and Green courses, with separate classes for boys and girls on each. The winner in each class gets 100 points, 2nd place gets 99 points, and so on, then each club’s best 6 scores are added up to find their total. This year, there were 11 ESOC competitors. MAROC won the trophy again, with 594 points, closely followed by Moravian with 593 points. ESOC came 5th, with 574 points - well done to all! "When Ewart told me that he was going to drive north to Braemar to support the ESOC team in the Jamie Stevenson Trophy, I jumped at the offer of a lift. This is because I had been to every JST since it started in 2003. As ScotJOS manager, I was involved in the organisation of every event. However to date the competitions had all taken place around Perth, but this year the event was to take place in Braemar (at Morrone Birkwood) definitely too far for me to drive, so thanks Ewart! We set off from Edinburgh at 7.45, picking up the Fahey family en route, and arrived at the venue in time for the parade of club teams with their banners and mascots at 11.30. Judy Bell had organised the ESOC team (and brought the 'decorated' club tent - there was to be a prize for the best one) and then the event was underway with the 1st start at 12.00. Then it was time for the first finisher to arrive on the run-in to much cheering and the excitement continued for the next few hours. There was then a (relatively) short wait for the results to be calculated. During the event there was a commentary from Rona Molloy (FVO) and random spot prizes were awarded (mainly T-shirts). In between cheering the finishers, I spent my time chatting to people that I hadn't seen in a long time. MAROC have won nearly every event since the JST first started. 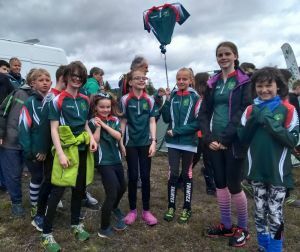 This is a tribute to their team of junior coaches (led by Jon Musgrave and Sarah Dunn) and the time spent encouraging school pupils from their two secondary schools, Banchory and Aboyne Academies. Well Done also to MAROC member Denise Wright who has co-ordinated it all. Especially Well Done to our ESOC winner Maja Robertson who won the Orange girls class. Other top 10 results were: Yellow Girls - Megan Brown 5th, Jasmine Muir 9th; Yellow Boys - Rowan Lawlor 5th, Calum Robertson 6th, Tom Tynan 10th; Green Girls - Rachel Brown 6th. Most importantly, ESOC came 2nd in the 'best decorated club tent competition', Well Done Judy!" Full results, Routegadget and other details about the event are available on the Jamie Stevenson Trophy 2018 page of the MAROC website.